‘Sick’ messages describing Polish people as ‘vermin’ have been distributed in a Cambridgeshire town after Britain voted to Leave the EU. 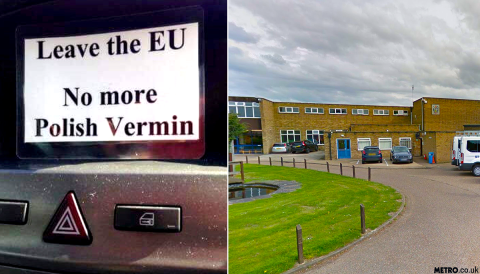 Laminated cards reading ‘Leave the EU, No More Polish Vermin’ were placed on doorsteps and near a school in Huntingdon. The person responsible even went to the trouble of printing cards in Polish, which translate as ‘go home Polish scum’. I went to pick my mum up around 9am and was disgusted to see what somebody had left on her door step. My mum has a few Polish neighbours who are very nice and she was very upset to see these kinds of messages. It is sick to think somebody would go to the trouble of printing, lamenting and distributing them.’ Regardless of what you think about the EU this kind of thing is unacceptable. A number of cards were found near St Peter’s School by a teenage pupil. Some had been pinned under rocks so they would not blow away. Man behind 2nd EU referendum petition was actually a leave supporter In the area, 54.2% of voters backed Brexit while 45.8% voted Remain. A spokesperson for Cambridgeshire Police said: ‘If there’s anybody who has got any information about the source of it, they can get in touch.’ If you have any information about where the cards came from, call Cambridgeshire Police on 101. Meanwhile, suspected racist graffiti has appeared on a Polish community building in London. Police are investigating the criminal damage, thought to be racially-motivated, at the Polish Social and Cultural Association in Hammersmith. With many thanks to: The Metro .co.uk for the original story.